Once while visiting the Middle East, I had this amazing lentil rice dish that blew my mind. It was Basmati rice with lentils, raisins and aromatic hints of wonderful spices. That dish stayed with me, and I can’t believe it took me this long to try and recreate it! But I finally got around to it, and I seriously cannot wait to make it again. In fact, it’s on the menu for this Friday night :). In order to make it more of a Weight Watchers recipe, and to increase the nutritional benefits, I made a few changes. The biggest change was that instead of rice, I used quinoa for added protein, fiber and nutrients. Next time, I want to add some dates, as the restaurant version I had included them, but I had forgotten about it until I was in the middle of eating it. Overall, it was truly delightful, and very satisfying due to all the fiber. 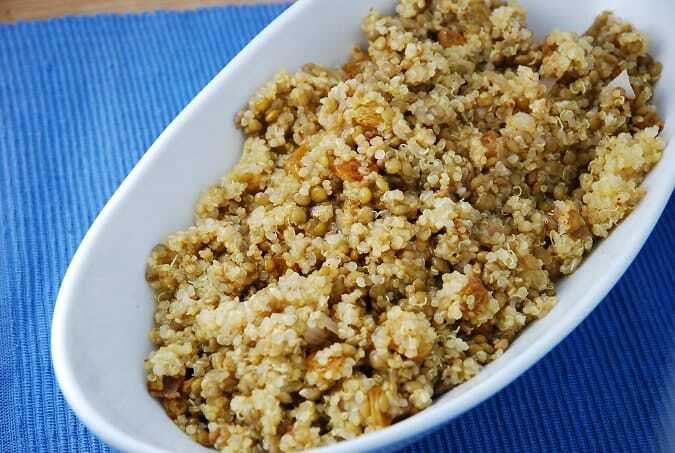 This wonderfully unique quinoa recipe makes this a perfect Weight Watchers side dish to serve with your favorite Middle Eastern meal. Taking an old Persian recipe an adding a new spin by creating this delicious and unique quinoa recipe. Flavorful, healthy and very filling, the distinctive flavor combinations of this dish are a real palate pleaser. Cook lentils in salted water over medium high heat, until just tender. Drain and set aside. Prepare quinoa according to package directions. Once ready, place in a large bowl and set aside. Meanwhile, heat olive oil in a small skillet over medium high heat. Once oil is hot, add in onions. Sauté until onions begin to become translucent. Mix in raisins, and stir to combine. Then add in cinnamon, cumin, cardamom, and salt & pepper. Add in cooked lentils and mix well. Add the lentil and raisin mixture to the quinoa and toss to combine. Season with additional salt and pepper as desired. I have not had much luck with using quinoa but I must try this!! About how long do you cook the lentils? This reminds me of an Arabic dish called mujaddara! I usually make it with bulgur instead of rice or quinoa, which adds some whole-grain goodness as well.